and dinner from 6.30pm to 10.30pm. GIVE yourself a rollercoaster ride of tastes with the UOB Chef’s Creation promotional menu at Si Chuan Dou Hua Restaurant in Parkroyal Hotel Kuala Lumpur that combines Szechuan, Cantonese and fusion cuisine into a set meal for two. “Though the combination of dishes, ingredients and such was a bit difficult to come up with, the end result is a well-balanced menu. I see it as a smaller scale of a Chinese wedding dinner,” hotel executive chef Gary Lim said. Impressive: Watch the tea-pouring displays by the special tea server at Si Chuan Dou Hua Restaurant in between dishes. Lim also said that where Szechuan cuisine dishes was concerned, they used authentic sauces from the Chinese province itself and as such, dishes could be a little spicier. The set lunch starts off with the ‘Combination of three Delicacies’, namely Japanese cucumber, chicken and jellyfish that serves as a hint to the what the rest of the menu will be like. “Both the cucumber and chicken have a bit of a spicy bite to it due to the Szechuan peppercorn and pepper oil. The jellyfish however is cooked with some sesame oil, oyster and soya sauce to avoid it becoming too bland,” Lim said. He also pointed out the the chicken, named Pang Pang, is boneless and has been tenderised by beating it with the flat side of a knife, hence its name, before it is cut into strips and cooked. The next dish, Diced Chicken with Dried Chilli and Cashew Nut, kicks in the spiciness up a notch or two. 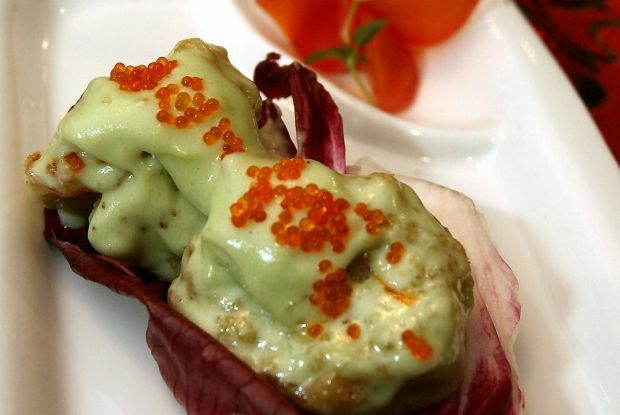 “We then introduced a different kind of ‘hot’ to the diners’ palate with the Deep Fried Prawn with Wasabi Sauce and Fish Roe,” Lim said, adding that both dishes are considered specialties of the restaurant. The kitchen is headed by Chinese chef Eric Chew and Szechuan chef Wong Yunghai. At the half-way point of the menu, the meal starts to tone down with the following dishes of Stir-fried Beef in Chinese style and Dumpling noodles. Finally, we are treated to the Chilled Honeydew Melon with sago, the sweet dessert that is refreshing after the meal. The restaurant also has a dinner set under the UOB Chef’s Creation promotion featuring Fresh Scallops with Fruit Salad, Braised Superior Shark’s Fin in Spinach broth, Spicy seafood combination, Marinated Spicy Beef on Hot Plate, Fried Rice with Century Egg and Salted Egg, and Sweetened Almond with Gingko Nuts. 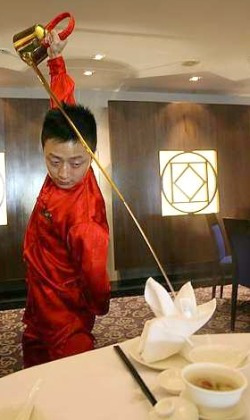 Diners at the restaurant will also get to watch the special tea-pouring performance of a tea-server from China who integrates martial arts and gymnastics to provide an elegant, skilled show of the simple act. UOB cardmembers can enjoy lunch for two at RM88++ or dinner for two at RM168++ at the restaurant until July 31.